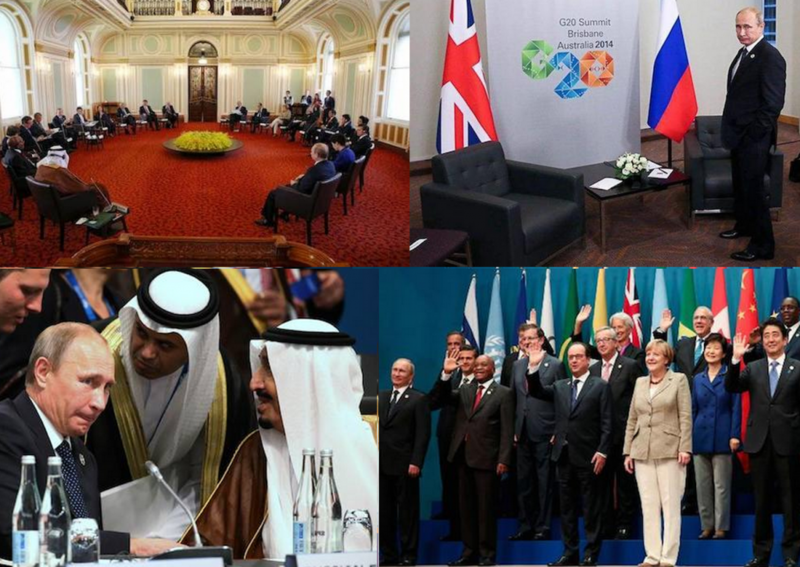 Russian President Vladimir Putin turned out to be the Anna Karenina of the Group of 20 major economies summit (G20), where he was ostracized by all Western leaders. On November 16, 2014, he was the first world leader to leave the G20 in a hurry, before the official conclusion of the summit. Putin claimed thathe wanted to leave early to catch up on sleep before going to work, as though attending the most important summit of world leaders was not part of his official duties. Putin faced intense criticism from Western leaders over Russia’s unsavory involvement in Ukraine, but attempted to downplay it. The event has been undoubtedly permeated by hostility towards Putin, amid fierce criticism of the Kremlin’s involvement in fostering the crisis in Ukraine. A chilly reception towards Russia’s unrepentant leader commenced with his arrival to the summit in Brisbane. While President Obama, German Chancellor Angela Merkel and Chinese Premier Xi Jinping were enthusiastically welcomed by Australia’s Governor General and Attorney General, Putin was greeted by the Assistant Defense Minister. Australian Attorney General George Brandis was standing nearby, but made no attempt to greet Putin. Even the docile koala bear, held by Putin during world leader photo-ops, didn’t seem comfortable to be in the grasp of the controversial figure. To contribute its own hostility to the event, Moscow deployed four naval warships near Australia in the lead-up to the G20 meetings. Ironically, one of the ships ― the Varyag ― was previously named “Red Ukraine.” Russian media claimed that it’s not uncommon for Russian warships to accompany the country’s leaders on foreign trips. Putin’s isolation at the summit was evident, with him being placed on the outer edge for the formal G20 leaders’ photograph. No one wanted to sit at the table with Putin during the lunch break at the summit. President Obama emphasized that Russia would remain in economic isolation as long as it continues to violate international law by providing heavy arms to separatists and terrorists in Ukraine. “We would prefer a Russia that is fully integrated with the global economy. But we are also very firm on the need to hold core international principles,” Obama said. “And one of those principles is that you don’t invade other countries or finance proxies and support them in ways that break up the country. At this point the sanctions that we have in place are biting plenty good,” the president added. The relationship between Russia and Germany is also deteriorating because of Putin’s dubious choices with respect to Ukraine. German Chancellor Angela Merkel said the European Union is considering additional sanctions against Russian individuals, because of the crisis in Ukraine. “The present situation is not satisfying,” she told reporters. Despite warnings of further sanctions, unless Russia withdraws its troops, artillery and material support for the terrorists out of Ukraine, Putin continues to reiterate the tinfoil conspiracy theories that blame the West for the popular revolution that overthrew Russia’s corrupt ally, Yanukovych. Hundreds of Ukrainian Australians staged a powerful protest to express their disgust with Putin’s actions in Ukraine. Demonstrators were draped with flags of nations that lost citizens when flight MH17 was shot down and wearing headbands reading “Putin, Killer”. The protesters lay on a large Ukrainian flag, objecting to the “murderous acts” for which they blame Russia’s president. Putin’s role as the pariah of the G20 summit is being underplayed by the Russian media, which is almost entirely controlled by the Kremlin. The country’s isolation from the West plays into the hands of the Russian leader, whose ongoing attack against freedom of the press and individual liberties is helping to cement his intended post as the lifetime president of Russia. After the world elected to look the other way during Russia’s aggression in Chechnya, Transdniestria and Georgia, Putin is notably irritated by the West’s attention to his militarized meddling in Ukraine.